Filed to: FCC leaks next Google Chromecast device?Filed to: FCC leaks next Google Chromecast device? 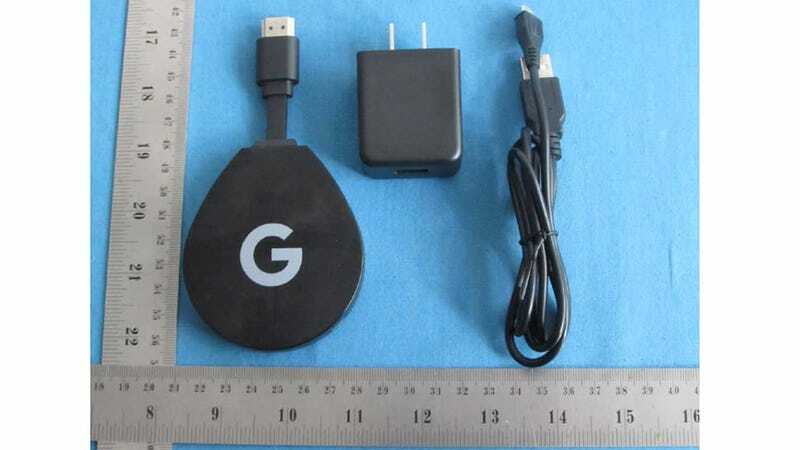 FCC leaks next Google Chromecast device? Google’s Chromecast devices are handy (and cheap) little dongles for anyone who wants to add streaming functionality to their TV. But since the Chromecast Ultra came out in the fall of 2016, there haven’t been any new Google-branded additions to the family. However, a new device filed with the FCC appears to have exposed Google’s plans. Manufactured by Shenzen SEI Robotics Co Ltd, the device is described as a 4K ATV Stick. Based on the internals, which include a quad-core Amlogic S905X processor, 2GB of RAM, 8GB of storage, and support for 4K video at 60 fps, it’s not a big stretch to say that ATV may actually be short for Android TV. Photos and images taken from the ATV’s FCC filing show the device and pages from its user manual. As a platform, Android TV devices come with built-in Chromecast functionality so you can stream a website or video from a compatible nearby device to your TV, while also supporting standalone Android TV streaming media apps like Netflix and HBO Go, which are slightly customized versions of traditional Android apps designed to look and function better on big-screen TVs. As with previous Chromecast devices, this mysterious device plugs into and hangs off the side of your TV using the attached HDMI 2.0 port. However, the new device seems to have one new trick older Chromecast device’s didn’t: support for Google Assistant voice controls via a mic built into its remote. In some ways, the addition of the Google Assistant turns the ATV Stick into kind a stripped down Nvidia Shield without all the game streaming stuff that pushes the Shield’s price to $180. While it’s not clear if this device will support HDR, and it’s not known how much it’ll cost, with Google’s I/O developer conference coming up shortly in early May, there’s a good chance we’ll get some concrete info pretty soon.